XV. (9) EDITH ALICE SHERMAN, dau. of Henry David and Sarah (Secrest) Sherman; born Dec. 10, 1870, at Monticello, Iowa; married Sept. 13, 1892, at Monticello, Iowa, Glenn Mark Averill*, son of Arthur Tappan and Allie (Doolittle) Averill, born July 15, 1868, at Cedar Rapids, Iowa. i. ** Arthur Tappan Averill II, b. Oct. 11, 1893, m. Carlota Belle Hamilton. ii. *** Worth Sherman Averill, b. Dec. 20, 1896, m. Margaret Beryl Beerstecher. 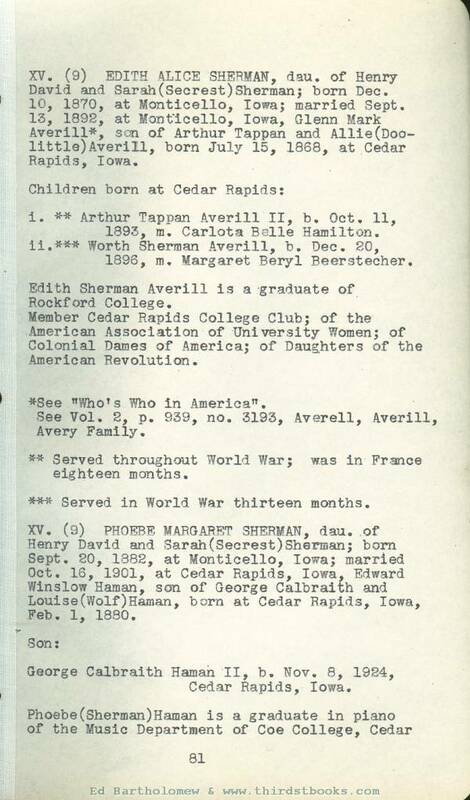 Edith Sherman Averill is a graduate of Rockford College. Member Cedar Rapids College Club; of the American Association of University Women; of Colonial Dames of America; of Daughters of the American Revolution. *See "Who’s Who in America". See Vol. 2, p. 939, no. 3193, Averell, Averill, Avery Family. ** Served throughout World War I; was in France eighteen months. *** Served in World War I thirteen months. XV. (9) PHOEBE MARGARET SHERMAN, dau. of Henry David and Sarah (Secrest) Sherman born Sept. 20, 1882, at Monticello, Iowa; married Oct. 16, 1901, at Cedar Rapids, Iowa, Edward Winslow Haman, son of George Calbraith and Louise (Wolf) Haman, born at Cedar Rapids, Iowa, Feb. 1, 1880. George Calbraith Haman II, b. Nov. 8, 1924, Cedar Rapids, Iowa. Rapids ; organ student of Clarence Dickinson, Chicago; successful piano teacher and church organist. For many years president of the Cedar Rapids Symphony Orchestra Association. Honorary life member Guild of American Organists. Member Beethoven Club. XV. (9) SARA McCLAIN SHERMAN, dau. 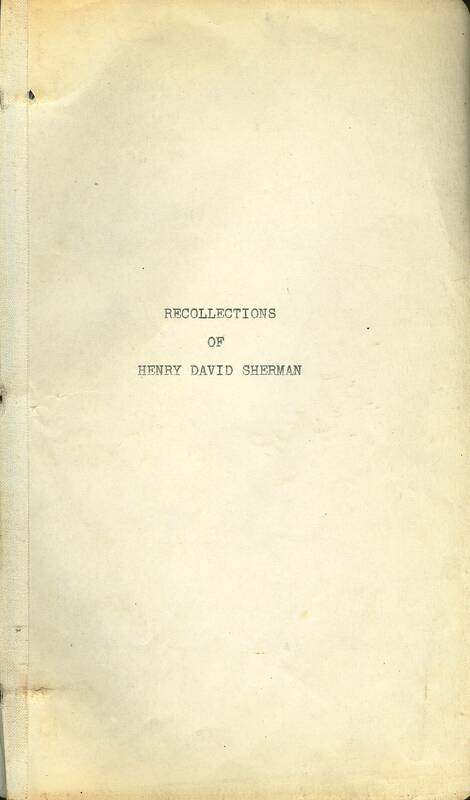 of Henry David and Sarah (Secrest) Sherman, born Dec. 12, 1890 (reseacher note: this is Sara's copy of her sister's book. Sara blotted out her birthdate ... 1883 ... and changed it to ... 1890 .... The 1900 C shows her born Dec 1883 and 16 years old. She did the same date change on page 74. Just a guess... in 1935 Sara married Grant Wood born 1891. She would have been nearly 52 years old to his 44 years. ) 1, at Monticello, Iowa, married 1, Apr. 30, 1903, at Cedar Rapids, Iowa, Alonzo Jones Maxon, son of Arthur Darwin and Nancy Jane (Strayer) Maxon, born Apr. 16, 1877, at Center Junction, Iowa. Arthur Sherman Maxon, b. Apr. 2, 1907, at Chicago, Ill.; m. Dorothy Crippen. Sara Sherman Maxon married, 2, Mch. 8, 1935, at the home of her son in Minneapolis, Grant Wood*, son of Francis Maryville and Hattie (Weaver) Wood. 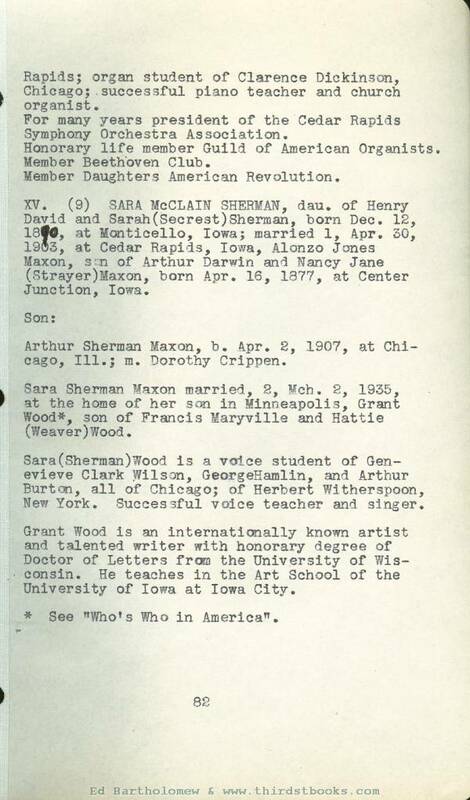 Sara (Sherman) Wood is a voice student of Genevieve Clark Wilson, George Hamlin, and Arthur Burton, all of Chicago; of Herbert Witherspoon, New York. Successful voice teacher and singer. Grant Wood is an internationally known artist and talented writer with honorary degree of Doctor of Letters from the University of Wisconsin. He teaches in the Art School of the University of Iowa at Iowa City. * See "Who’s Who in America". XVI. (10) ERWIN HENRY SHERMAN, son of Ernest Anderson and Robertine (Wheaton-Tone) Sherman; born Jan. 28, 1894, at Des Moines, lowa; married Jan. 1, 1921, at Cedar Rapids, Iowa, Elizabeth Agnew Bingham, dau. of Charles Wilson and Elizabeth (Ross) Bingham, born May 25, 1892, at Cedar Rapids, Iowa. Erwin Henry Sherman was a student In the University of Minnesota, 1913-1916. Fraternity, Alpha Delta Phi. Captain, adjutant of 2nd battalion, 1st Minnesota Field Artillery, Served on Mexican border from Aug., 1916 to Feb., 1917. Entered World War service Apr. 6, 1917. Captain in Rainbow Division. Sailed for France Oct. 18, 1917. Served throughout War, In Army of Occupation and later in Regular Army until Feb. 24, 1920. Graduate University of Toulouse, France, 1919. Present occupation. District Manager for General Exchange Insurance Corporation; subsidiary of General Motors. Lives in upper Montclair, H. J. with office in New York. XVI. (10). ROBERT ERNEST SHERMAN, son of Ernest Anderson and Robertine (Wheaton-Tone) Sherman; born Mch. 31, 1895, at Cedar Rapids, Iowa; married Sept. 10, 1923, at Minneapolis, Minn., Jessie Elberta Broadwell, dau. of James Elbert and Sarah Roxanne(Lovell) Broadwell, born Jan. 12, 1898, at Sparta, Wisconsin. Sarah Lou, b. Aug. 6, 1933. 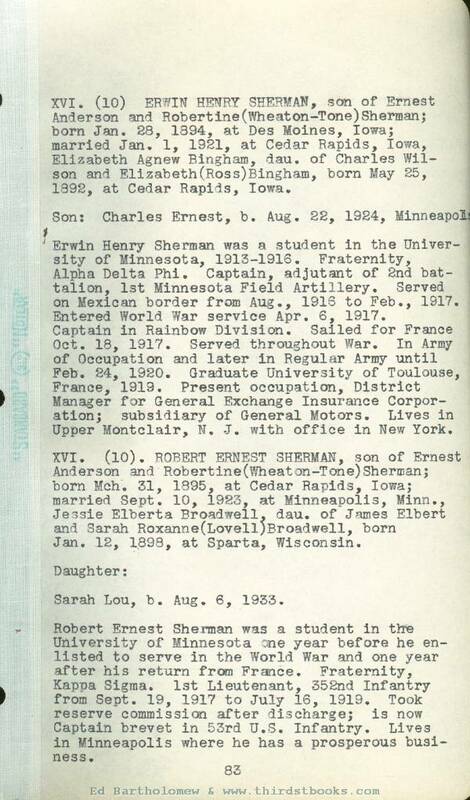 Robert Ernest Sherman was a student in the University of Minnesota one year before he enlisted to serve in the World War and one year after his return from France. Fraternity, Kappa Sigma. 1st Lieutenant, 352nd Infantry from Sept. 19, 1917 to July 16, 1919. Took reserve commission after discharge; is now Captain brevet in 53rd U.S. Infantry. Lives in Minneapolis where he has a prosperous business. XVI. (10). BESSIE FAITH SHERMAN, dau. of Ernest Anderson and Robertine (Wheaton-Tone) Sherman, born June 27, 1906, at Cedar Rapids, Iowa; married Sept. 23, 1931, at Minneapolis, Minn., William Joseph Routledge, son of George and Jane (Anderson) Routledge, born Aug. 1, 1904, at Mexico City, Mexico, of English parentage. 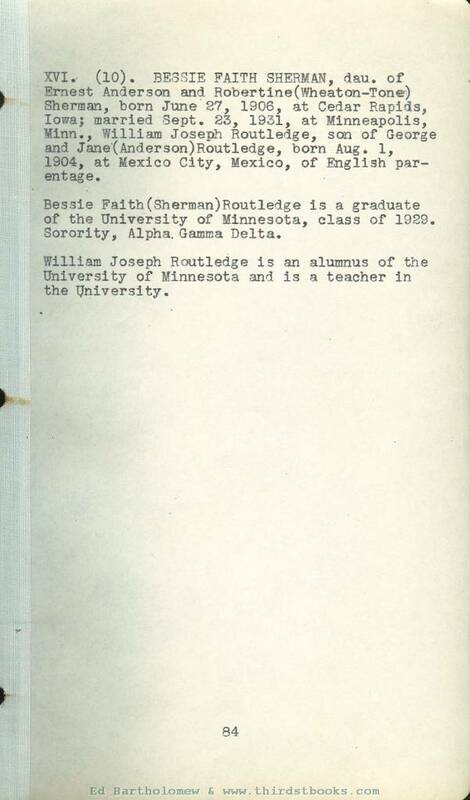 Bessie Faith (Sherman) Routledge is a graduate of the University of Minnesota, class of 1929. Sorority, Alpha. Gamma Delta. William Joseph Routledge is an alumnus of the University of Minnesota and is a teacher in the University.